These are skills that are fundamental to learning and performance in education, work and life. They are universal. Each Core Learning Skills Unit has a focus core skill and as we work through the complete set of units during a school year, this will support systematic development of the children’s skill set. At the start of each unit the class teacher will assess the class and decide which key elements of the Core Learning Skill they will be working on during the half term. Sometimes the learning skill is taught in a separate lesson but it may also be taught through the context of another lesson, for example learning how to work with other children as part of a team in a PE lesson. The following information explains a little more about each of the Core Learning Skills. The focus of this unit is on children's ability to learn as part of a group and there is also a focus on how to be a good member of a social group. The children will be thinking of different teams in real life situations, such as sporting teams, teaching teams, operating theatre staff, postal service teams and waste collection teams for example. We want to help the children to reach the understanding that all members of a team need first of all to be good team members and secondly need to perform their role well in order for the team as a whole to be successful. The skills gained during the focus on collaboration skills during this half term will continue to be used and extended during the rest of the school year. One of the strategies we use as part of this unit is the idea of assigning team roles to children working in a group together. Team member - Every person in the team is a team member, even if they have an additional role as below, and should be connected and contributing to the team, this includes listening to others’ ideas; linking their own ideas to those of others; challenging and compromising. Timekeeper - Keeping the team focused on time. Tracker - Monitors the team’s progress of the assigned task and keeps them on track. Messenger - Messenger is the only one to ask for help. The Messenger asks all the team members to help answer a question (C3B4ME) before going to an adult. Only the Messenger goes to ask for help. The Messenger also collects resources. Skill builder - Monitors the team’s use of the core skill that is the focus of the activity e.g. taking turns, listening, encouraging, etc. Noise assessor - Monitors appropriate noise levels according to the class ‘noiseometer’ and uses agreed signal to indicate to the team to moderate their noise levels. As children progress through the school we will help to build their ability to plan and carry out a range of roles successfully. For example in a small group of young children the teacher may give out 2 or 3 roles. In upper Key Stage 2 children may work together to choose their own roles and the adults would help by supporting teams to review their own progress and providing feedback. Part V gives the children opportunities for Developing Independence and Responsibility in other lessons. Part I is a supportive tool which allows the class teacher to plan out the activities which will best support their class. By the time that children leave our school we want to make sure that they have the skills to research and complete their own small project and that they are able to look after themselves by making good life choices, such as choosing healthy foods and exercising. The four parts following on from Part I may vary from class to class depending on what the teacher finds when they complete the audit. One class may focus on 'Independent Research Skills' while another may focus on 'Encouraging Children to ask Questions'. In this unit children will be supported to build their skills and capabilities in order to improve their own learning and performance. These skills are not just important in the classroom but also in everyday life. We consider these skills to be so important that some lessons will be focussed exclusively on developing these skills. E.g. What can the children do to help them understand themselves as learners and know what they can do for themselves to become an even better learner? Teachers will explain to pupils that they themselves need to be thinking about how well they are learning these skills, and what each of them needs to do in order to improve and use these skills in a variety of contexts. The children will continue to learn to apply these skills across the curriculum and encouraged to think about how they could apply these skills to their own everyday lives. Do I understand the challenge? How am I going to go about this? What learning strategies can I use? Is there anything I can do to prepare myself to learn? Have I chosen my attitude? Am I determined to do my best? Am I ready to take the risk of getting it wrong? What shall I do if I get stuck? Do I need to redo my plan? What would I do differently next time if I did this again? Have I used my learning strategies tool kit? In this unit the children will be learning how to feel confident in their own skin and they will also be developing their empathy skills so that they can understand how other children might feel in different situation. For example they might look at what particular strengths they have both inside and outside of school and also look at which activities are important to them. Through stories children will learn to understand why others may feel the way they do in a variety of contexts. The children will also learn the mantra Stop, Think, Choose, Do to help them to work through any problems they might encounter. This could be a problem in their learning or it could be a friendship problem at break time. What do we think has happened? What could we do to solve the problem together? The children will be taught to extend this to real life situations. For example, what would you do if you found a watch in the changing rooms after your swimming lesson? Children will be asked to think through all the possible outcomes and the effect of these outcomes on themselves or others. This unit introduces the idea of a thinking pathway which is used to support children's thinking as they proceed from the start of a problem/challenge through to a solution. The thinking pathway starts with a challenge. It then asks the children to check they understand what the task is before they start to brainstorm ideas. It then asks them to sort their ideas before selecting the ones which are the best. The children then learn how to organise and expand their ideas before presenting and evaluating what they have found out. This unit also supports children's moral development, enabling pupils to develop a set of values that are both personal, relating to self interest and relating to the interests of others. Children are introduced to De Bono's Thinking Hats as a quick, simple and powerful strategy to help improve their thinking. It does this by encouraging the children to recognise what type of thinking they are using and to apply different tupes of thinking to the subject. We all use different types of thinking, usually without realising it. For example, if we are feeling pessimistic about the situation, that is the only type of thinking we apply! This limits our ability to see all the issues. 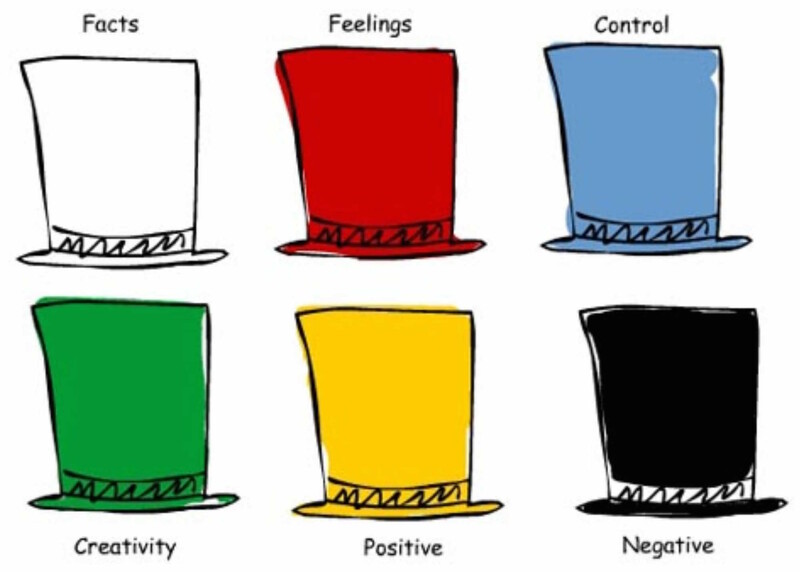 Putting on a coloured hat and thinking in that type of way expands our ability to think around any issue or problem. 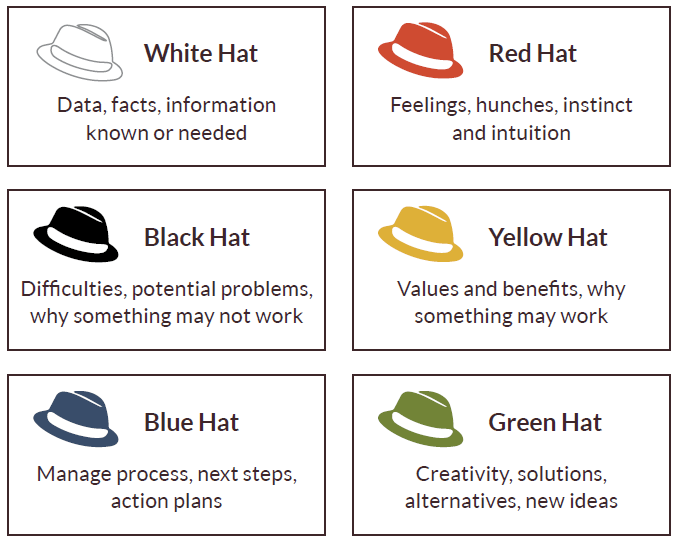 White Hat thinking focuses on facts and information. What do we know? What questions should we be asking? Red Hat thinking is to do with feelings, intuition and emotions. It’s OK to put feelings forward without justifying. Black Hat thinking points out risks and advises caution. What are the dangers? Why might this not work? Yellow Hat thinking is sunny and positive. Be hopeful and optimistic. Seek out the benefits. Consider the values. Green Hat thinking is growth, energy and life. Be creative, propose new ideas and variations. Blue Hat thinking considers the thinking processes themselves. Define the problem, identify what needs to be achieved. Check appropriate thinking skills and strategies are being used. In this unit children will be taught the skills needed to become a great speaker and a brilliant listener. Classes have Meeters and Greeters who will be taught to welcome visitors to their classroom. The children will be learning how to introduce themselves and how to explain about what they are learning. The children will be thinking about what makes a good listener, e.g. eye contact, positive body language, sitting still, asking questions at the end, being able to talk about what they were listening to. The children will also be learning how to become confident and articulate speakers. They will be encouraged to answer questions in full sentences and to give extended answers to questions. They will be challenged to think more deeply in their lessons and to speak clearly, loudly and confidently in a range of situations, e.g. small group, whole class, one to one and in assemblies and school productions. The children will have opportunities throughout school to apply their speaking and listening skills. As they get older for example they will be taught how to debate. They will learn about the structure of a debate and the roles of proposers, seconders, opposers, floor speakers and chair person. Children will be taught to understand that formal, polite language is used in a debate in contrast to how we might speak informally to friends on the playground.